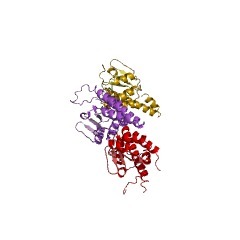 This is a short protein of unknown function it is found at the C-terminus of proteins in the UPF0302 family. It is named after the sequence of the most conserved region in some members. This short domain is found at the C terminus of proteins in the UPF0302 family. The domain is named after the sequence of the most conserved region in some members. The function of this domain is unknown. There are 2552 IDEAL domains in 2552 proteins in SMART's nrdb database. Taxonomic distribution of proteins containing IDEAL domain. This tree includes only several representative species. The complete taxonomic breakdown of all proteins with IDEAL domain is also avaliable. Click on the protein counts, or double click on taxonomic names to display all proteins containing IDEAL domain in the selected taxonomic class.